Granddaughter: I’m Wordsworth the poet. I’m trying to catch some dewdrops. From a young mother of two pre-schoolers: I read Wordsworth Dances the Waltz to my children. One day my four year old asked me, “Why do you talk so mean to Grandma?” I realized they have turned into Wordsworth and are teaching me about compassion and kindness. Three classes in an elementary school used this book to work on a year- long project at a nursing facility. I love the scent of Christmas trees. After this book was published, many readers wrote me during the holidays assuming that I no longer use real Christmas trees. They use artificial trees to help save our trees. Gulp. I now use artificial trees. A grandmother of teens emailed this: I gave this book to my teenage grandchildren. I was so happy to hear them say, “He’s talking about us!” We are all being more aware of time being used on our electronic devices. Thank you, Wordsworth. Come join us on the 9th. So here I am, reading Wordsworth, It’s In Your Pocket. Wordsworth is in deep grief because his friends are all addicted to their electronic devices. How can he get them back into the real world of friends? An old mouse tells him the answer is in his pocket. During the reading, I heard a woman say the battery to her phone had died. Yes, Wordsworth has his job cut out for him. 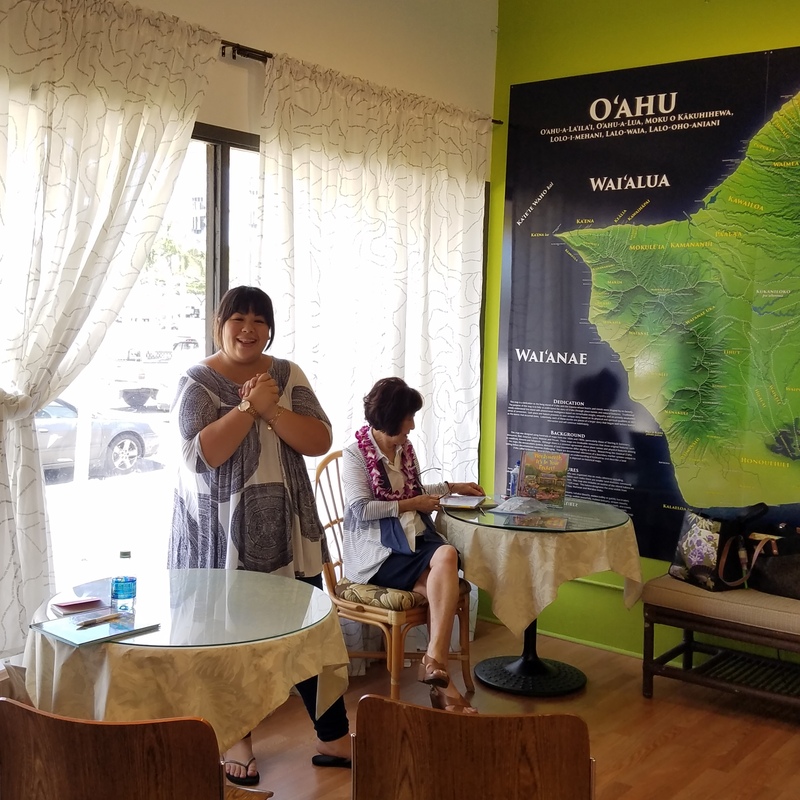 Thank you Christine Reed of Basically Books in Hilo for the standing room only event. It takes Wordsworth to bring the past and present together. 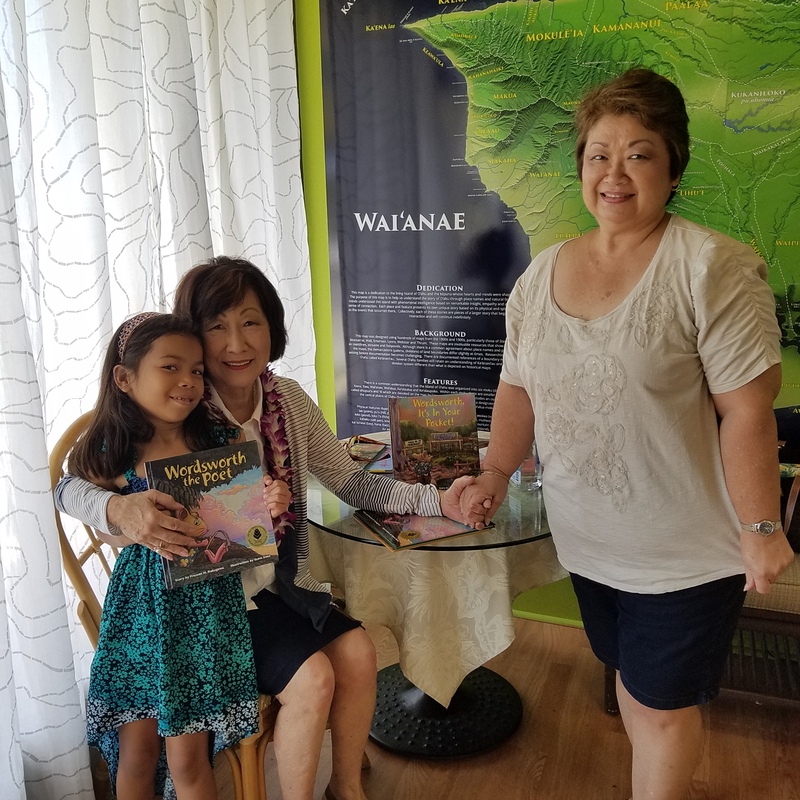 I had two special guests at my Wordsworth reading at Native Books this weekend. Months ago, young Erika wrote a poem for Wordsworth and sent it to Wordsworth, and they are now active pen pals. They both take karate. Sandi (far right) was a former kindergartner and first grader when I was a 24-year-old teacher. And here she is, after all these years. She showed me a class photo and I recognized each by name. My heart almost blew up. 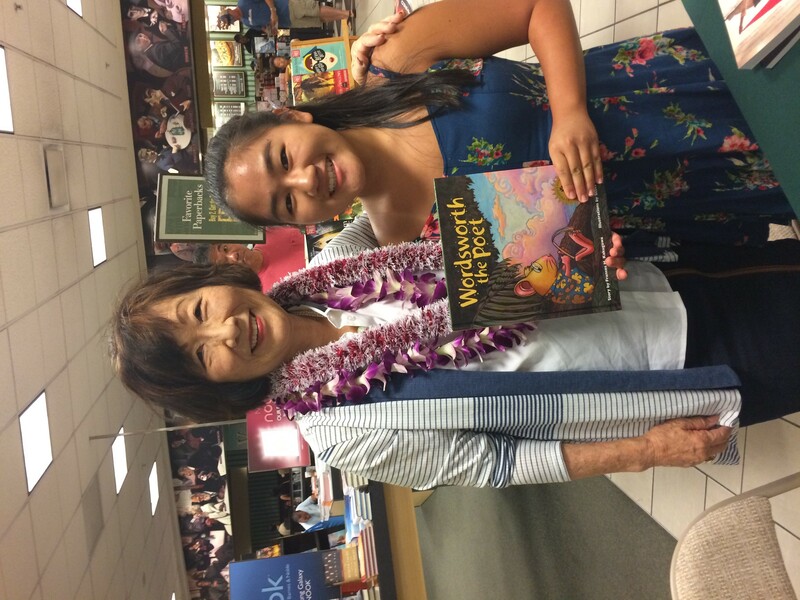 After Native Books, I went to Barnes & Noble at Ala Moana. (Thank you, Ipo Roney, for your care there.) There I had a visit from Alia. Since then, Alia has attended each of Wordsworth’s four books signing. She was there on Saturday for the fourth book: Wordsworth, It’s in your Pocket. Alia is now a senior in high school.